President Bouteflika will run for a fifth term amid concern about a political transition following the 81-year-old’s rule. For some he is respected for ending the country’s civil war. For others he is an autocrat. Algeria’s ailing President Abdelaziz Bouteflika announced on Sunday he will seek a fifth term in April 18 elections, amid concern over the 81-year-old’s health. 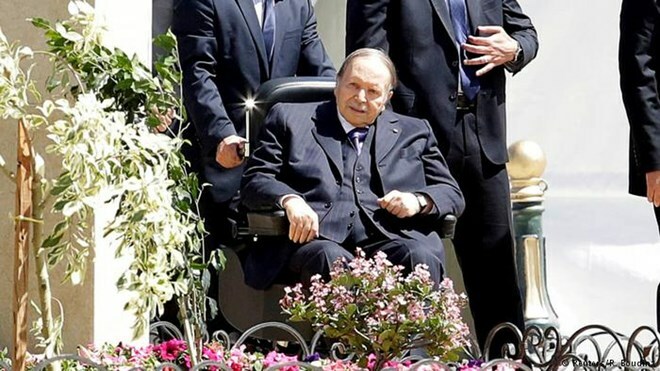 Bouteflika has used a wheelchair since suffering a stroke in 2013 that left him with difficulty speaking and moving. He is rarely seen in public. “Of course, I am no longer the same physical force as before — something that I have never hidden from the people,” the state news agency APS reported him as saying. “But the unwavering desire to serve… has never left me and it allows me to transcend the constraints linked to health troubles which everyone may one day face,” the president added. The announcement came after the ruling National Liberation Front on Saturday declared Bouteflika to be their presidential candidate for another five-year term. Bouteflika is respected in Algeria for ending the North African country’s decade-long civil war between Islamic insurgents and the military which killed nearly 200,000 people. He was the only North African leader to survive the Arab Spring upheaval without facing protests, in part due to citizens’ concerns over renewed instability. He subdued potential unrest through promises of reform and wage increases financed by the country’s oil and gas revenues. But in recent years the country’s finances have been weakened by low oil prices, forcing cuts in state subsidies. Algeria’s Western allies are concerned about an unstable transfer of power in a country on Europe’s doorstep. The country faces al-Qaida linked militants in the Sahel, turbulence in neighboring Libya and is a potential gateway for migrants seeking to reach Europe. The opposition has questioned the president’s health and ability to hold office. Rights groups and the opposition also accuse him of being authoritarian. The Front of Socialist Forces, the country’s oldest opposition party, called last month for an “active, intensive and peaceful boycott” of the vote and declared it would not field a candidate. Bouteflika promised that if re-elected, he would implement political, economic and social reforms through consensus. “If you give me the honor of your precious trust next April, I will invite within this year all forces of the people to hold a national symposium, which will focus on reaching consensus on reforms,” he said. APS news agency also said Bouteflika wanted to amend the constitution if re-elected. It did not specify what changes these would be. Bouteflika’s top challengers are former Prime Minister Ali Benflis, retired General Ali Ghediri and the leader of a moderate Islamist party, Abderazak Makri. Bouteflika won the 2014 election with 81 percent of the vote despite not campaigning and voting from a wheelchair.